We offer after school Recreational and Advanced classes for ages 4-16 and all abilities. Sessions last 1 or 2 hours. Fees are payable on a termly basis and all gymnasts will require British Gymnastics membership after their first session. See Here. Advanced Recreational classes sre for those who are passionate about gymnastics and want to do more than the standard 1 hour class. You will build on strength and flexibility and develop higher level skills. For this class you will need solid (but not necessarily perfect) bridge, rolling, cartwheels and handstands. Participants also have the option to enter county and regional competitions at the Novice and Intermediate levels alongside our main squad. 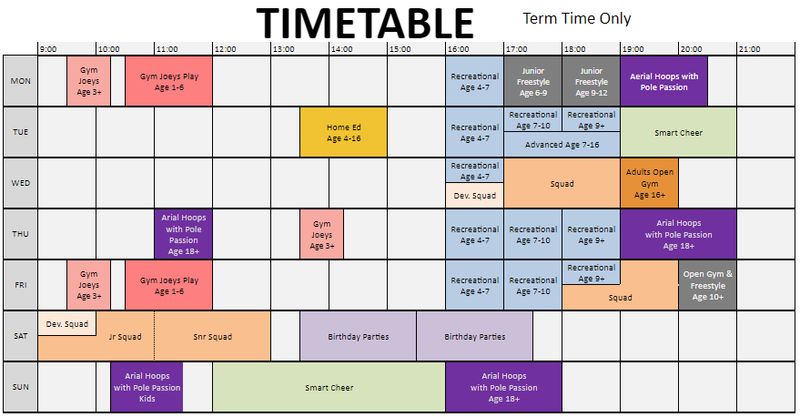 Gymnastics Camp - These are day long fun workshops involving games, gymnastics, circus skills and other fun activities. Family Fun - Uncoached drop in sessions where the whole family can play. Classes may be added or changed to meet demand.